A rugged stainless steel design and IP67 rating make AE 403 the right choice for a variety of industrial applications. The backlit display shows results in 40mm-high digits and changes color when the weight is over, under or within limits. Easily monitor overloads with the capacity tracker. The included bracket allows the AE 403 to be mounted on the wall or other vertical surface for optimum visibility and flexibility. 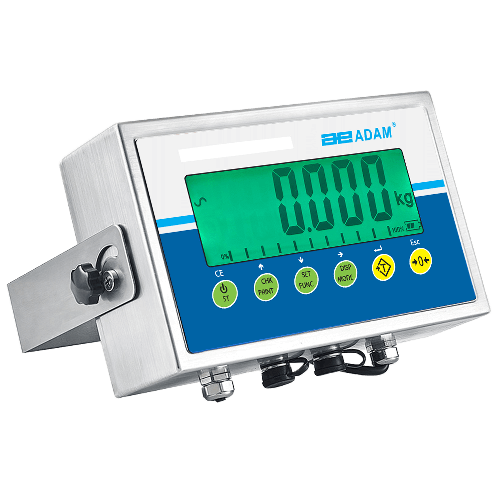 The multi-function AE 403 indicator can be combined with weighing platforms to handle demanding industrial tasks. It performs well on the loading dock, at food processing plants, in agricultural settings, or in shipping and receiving areas. The AE 403 is the successor to the AE 402. For more information on our AE weight indicators, please contact us.